Quico says: Has anyone else noticed the way the runaway success of Noticias24 has spawned this whole ecosystem of copy-cat sites on the Venezuelan internet? Minuto59 is just one of the bunch: people who saw that, “wait a minute, these N24 folk must be making a ton of money freeloading off of other people’s work…we want in on that game!” What could be more Venezuelan? By which I mean what could be sadder, lazier, and less creative? 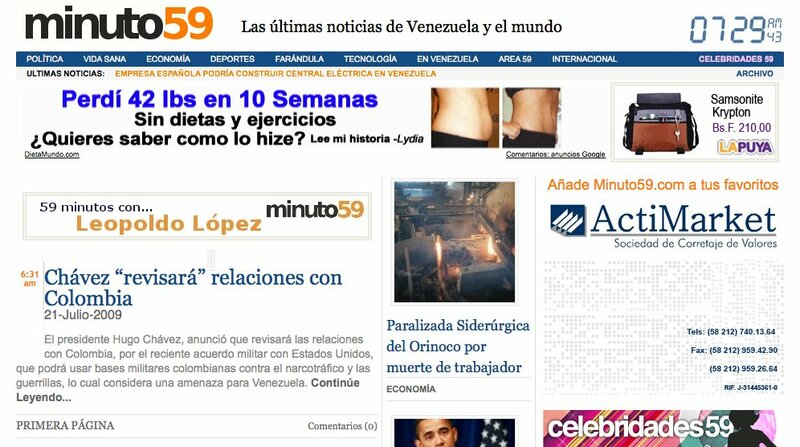 Folks, Venezuela already has a Noticias24. We don’t need another one. Notice all those posts on your site with Zero Comments? There’s a message in that for you. Think about it. Post 23 of 100. G’morning!